If you’re heading to the Philippines, then the city of Manila is a gem which is often overlooked as being merely a gateway to other places and particularly the islands of the Philippines. 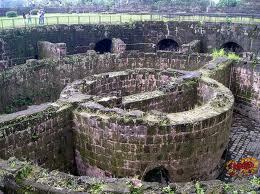 Intramuros is a fort built by the Spanish in the late 16th century. Its name means literally ‘inside the walls’ and its walls were twenty feet high and over a mile long, and it protected a mixture of rich mansions, churches and schools. Although it was destroyed in 1945 in the battle between America and Japan, much of it has today been rebuilt and it is now an interesting attraction to visit. In the daytime, one of the best places to experience a bit of Manila is to visit Roxas Boulevard. This is the main promenade of Manila and definitely a must when in this city. Full of open air cafes and benches along the waterside, this is a great place to people watch, and many people come here from families enjoying some time together to couples seeking a romantic moment watching the sun set. Originally named Luneta Park because of being shaped a bit like the crescent moon, Rizal Park in Manila is one of the largest parks in South East Asia and is spread over nearly 150 acres of land. 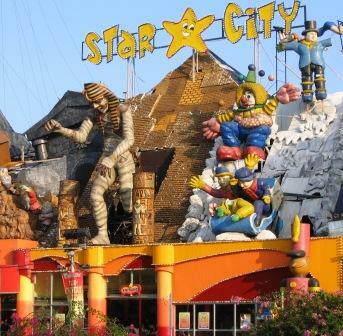 There is plenty to see here too with a Japanese garden, a Chinese garden, free music concerts, a planetarium and roller skating rink as well as plenty of open space to walk around and enjoy. Fort Santiago was another of the many places here that was destroyed during WWII and then later restored. It became a shrine of freedom in 1950, and is a very interesting place to learn more about the history of Manila, the Philippines and in particular the countries colonial history. Manila Zoo and Botanical Park is one of the oldest zoos in Asia and was opened in 1959. It is home to over 800 animals including Mali who is a 24 year old Asian elephant who came here as an orphaned calf. You can also see Bengal tigers, crocodiles and many other animals here. The City Marikina Shoe Museum is a one of a kind place to visit. Housed in a former rice mill that was built around 1860, it now traces the history of the shoe industry in Marikina which is the shoe making capital of the Philippines. Imelda Marcos’ infamous collection of 1,500 pairs of shoes is housed here too. 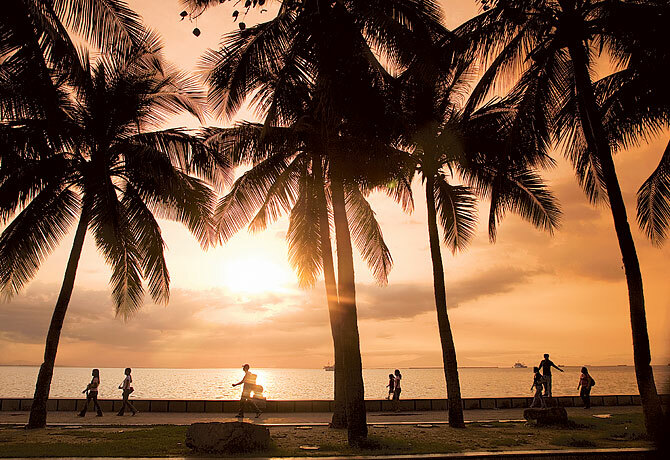 In the daytime, one of the best places to experience a bit of Manila is to visit Roxas Boulevard. Sunsets on Manila Bay. Manila is one of remarkably few cities in Asia that looks out to the west over the sea. Throw in one of the few plus sides of the Filipino capital’s pollution problem — the smoggy clouds send light and colour bouncing all over the place — and you’ve got a recipe for utterly spectacular sunsets. The Coconut Palace . This tremendously gaudy monument to the excess of Ferdinand Marcos’s corrupt regime — and his shoe-loving wife Imelda’s penchant for showing off — is now the vice-president’s home and office. Jeepneys are cramped, they’re gaudy and they’re often belching fumes but the jeepneys are an integral part of Manila’s character. These elongated, privately owned jeeps are painted in every colour the driver can get hold of and are adorned with religious or political slogans. Carlos Celdran-Far and away the city’s most popular guide, Carlos Celdran hosts theatrical tours around historic Intramuros that bring the often-tragic history of Manila to life. The “performance” goes through the Spanish, American, Japanese and post-war eras, throws in chaotic cross-town pedicab races and sets the emotional compass swinging from horror to laughter. celdrantours.blogspot.com. San Agustin Church-One of the few buildings to survive World War II’s destruction of Intramuros, this is the oldest church in the Philippines. It dates from the 16th century, has bags of baroque flourish and numerous richly decorated shrines. Intramuros adds Latin American- banana-republic-transported-to-Asia vibe is Intramuros, the historic heart of Manila. The area was turned into a fortified city within a city under Spanish rule and the Iberian influence on much of the architecture is immediately obvious. The walls are not always in the greatest state of repair but Fort Santiago at the far end is holding on. Its gardens, views over the river and cannon-laden bastions evoke the city’s rich history. Between Intramuros and Rizal Park lays one of the world’s more absurd golf courses. Built into the former moat around the walled city, the Club Intramuros Golf Course offers the chance to mishit drives into the walls while traffic roars to the other side. Hobbit House-As gimmicks go, you would have to try hard to beat a Tolkien-themed bar and restaurant staffed and managed by “little people”. It might sound crass, and it’s unquestionably a tourist trap, but it’s actually one of Manila’s best places for a drink. Ayala Museum-Inside the Ayala Centre is easily the best museum in the Philippines. The Ayala Museum’s displays of gold and Filipino art are good but the star attractions are the 60 dioramas that tell the story of the country’s convoluted history. American Cemetery and Memorial is maintained by the American Battle Monuments Commission, this giant and utterly sobering cemetery is the largest of its kind in the world. Covering 62 hectares, 17,202 who died during World War II are buried here, while the names of 36,285 whose bodies were never found are etched on the memorial walls. 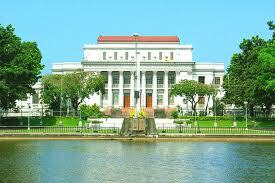 Malacanang Palace is the seat of political power the Malacanang Palace. Any trip to the Philippines, to be worth boasting of and memorable, should include seeing the Malacanang Palace personally. Who knows, one may even chance upon taking pictures with the Philippine president herself. In addition, the Palace has been home to many Philippine presidents from the time Manuel L. Quezon was seated in power in the early 1900s. Bay Walk. The local government of Manila has developed the stretch of historical Roxas Boulevard from the US Embassy to the Coastal Road. Visitors can now have a better panoramic view of Manila Bay and its glorious sunsets. Local and foreign tourists can while time away as they stroll leisurely along, enjoying clean, nice, and safe surroundings. Tourists booked in nearby world-class hotels (along Roxas Boulevard, in Malate, or Ermita) can enjoy the one of the top 5 reasons to visit Manila, Philippines. Ocean Adventure is the latest touring activity craze in Manila should makes on the top 5 reasons to visit Manila, Philippines. 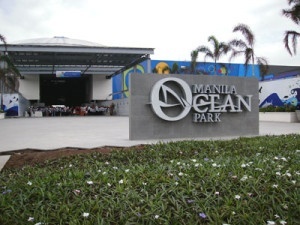 Just behind the Quirino Grandstand, also in Rizal Park, is the newest tourism feature called Ocean Adventure. In effect, it’s an ocean in a huge aquarium around and above people. 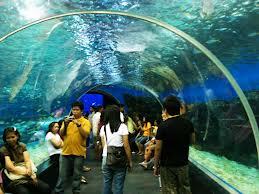 See different tropical marine life, big and small, gliding past above and around, secured by thick transparent glass walls. Jeff Harvie is an Australian Registered Migration Agent (MARN 0959797) who has given up the quiet life in Australia a few years back for one more adventurous with his Filipina wife and kids in Manila, Philippines. He runs Down Under Visa, which specializes in Australian partner visas for those Aussie men who fall madly in love with the local girls and want to bring them to Australia.